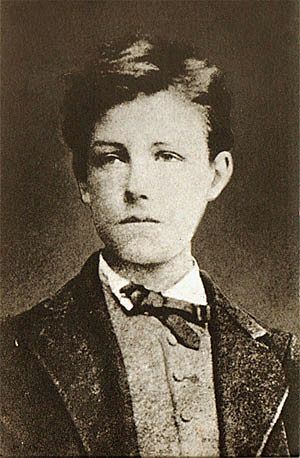 Jean Nicolas Arthur Rimbaud (20 October 1854 – 10 November 1891) was a French poet, born in Charleville. He wrote his best works when he was 15–18 years old. He was restless and moved around the world a lot. He was homosexual. He died of bone cancer just after his 37th birthday. Une Saison en Enfer (1873) – published by Rimbaud himself as a small booklet in Brussels. Although "a few copies were distributed to friends in Paris, Rimbaud almost immediately lost interest in the work." 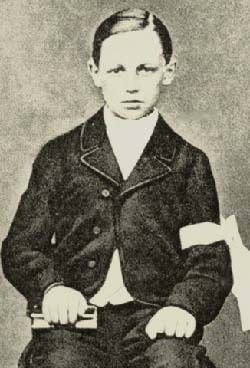 Rimbaud on the day of his First Communion. Arthur Rimbaud Facts for Kids. Kiddle Encyclopedia.